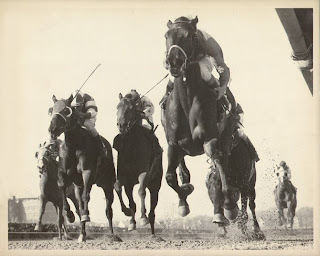 My comment: Dr. Fager broke the mile record set by Buckpasser in 1966. There are a number of interesting similarities between the two runs. Both records were set at Arlington Park (“an oval noted for its bounce” – NYT ). Braulio Baeza was the jockey for both rides. One of the most significant differences is that Buckpasser set the record carrying only 125 pounds as a 3 year old. Dr. Fager carried an astounding 134 (at the time, the highest weight ever by a Washington Handicap entry). OK, I was one of the doubters about Big Brown and I am still letting Saturday’s huge win in the Florida Derby sink in. The esteemed Steve Byk (At the Races) thought Smooth Air was sitting on a Sharp Humor type of performance who ran within a nose of Barbaro in the 2006 Florida Derby. Steve was exactly right, unfortunately, Big Brown ran a full second faster then Barbaro when he also won the race from an impossible post position. Those facts alone — a wider post and faster final time then Barbaro — are hard to believe. Let’s hope he stays healthy — he could be a good one. Being both a history lover and a horse racing lover, I find the combination of horse racing+history here to be fascinating! Keep up the good work! I’ll shall check back often. Sorry to pick a nit, but it was PHIL Goergeff on the call. When I was a kid growing up outside Chicago, I assumed every racecaller in America said “and hear they come spinning out of the turn”. I’ve already bookmarked this blog. Keep up the good work. ljk: Thank you for the contribution. I appreciate the “nitpick” and have made the correction. Thanks for the video–I was there that day (as a 7 year old) and hadn’t see it since. Thanks for the memory. On orders to Viet Nam, I drove from Ft Knox to Chicago for the ’68 race. I had $100 and had to drive to NY the following day. As luck would have it, all $100 went straight win on The Doctor! That and seeing Secretariat on both ends of the Crown in ’74 were my cherished memories that ran also to RoundTable at Arlington and Forego at Belmont. But thru it all, Dr Fager remains my favorite. Great stuff really enjoyed the replay. May have been the greatest feat by a race horse in history. I point out, he did not break very well, he was wide the entire turn and most of all, he was carrying 134 lbs. WOW! I had a quarter horse (appendix registry) whose grand sire was Dr Fager. I used him as a hunter/jumper until his death from a colon obstruction. He looked a lot like Dr. Fager; big and a dark brown-black. I had no idea my horse had this sort of breeding. He wasn’t fast but boy could he jump. Secretariat no doubt had the best performance of all time in the Belmont & considered unbreakable. No one calls it but I will not taking nothing from Fager. If Impressive ran the 1st 6 furlongs in 1:06 4/5 that can tell anyone that track was burning fast. The 1973 Belmont was so impressive that Charles Justice said Secretariat probably would have broke the record carrying 136 lbs.